The Syndicated Features weekly tabloid sections are quite rare, since they only ran in a handful of papers, most of them smaller weeklies. But if they're rare, then the feature Jigger is the comics equivalent of hens' teeth. The Syndicated Features sections were four page tabloids, and on the back 'cover' of each issue there was normally a half page ad. The ad space was reserved for the subscribing newspaper. They could put a house ad there, or sell the space to an advertiser. Since the ads are always black lettering on a one-color background, I'm guessing that Syndicated Features sent the tab sections out with a big blot of color there, and the newspaper ran the sections through their press once to add a black ink ad. When I was doing research for this series of posts, though, I came across a couple newspapers that apparently had no interest in selling ad space. They opted to have the syndicate include an additional comic strip on that half-page. That makes Jigger by Gus Jud one seriously rare puppy. In order to show you samples, I had to resort to the blurry microfilm versions above. Sorry about that. 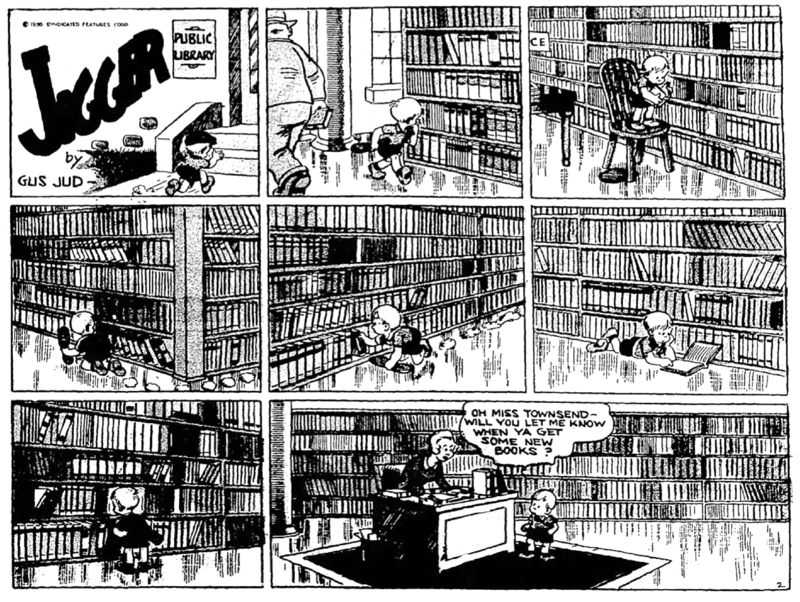 Gus Jud has only one other newspaper strip credit, for Little Dave. 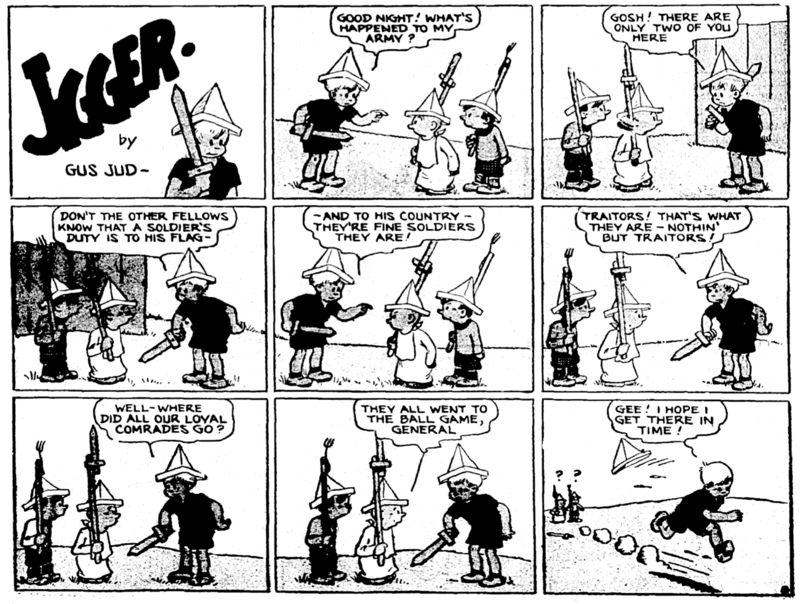 Both Little Dave and Jigger are strips about kids, sort of like watered-down Skippy and with workmanlike but unexceptional art. 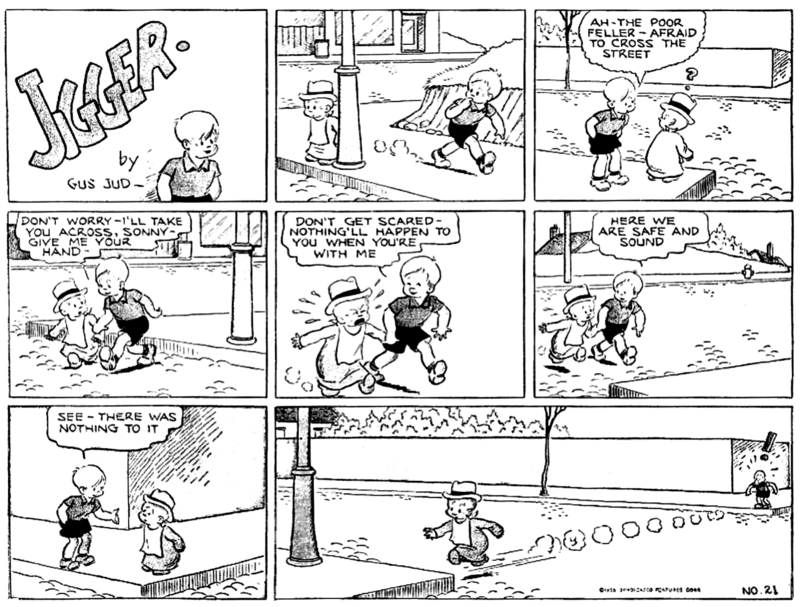 Oddly enough, in the 1940s Jud moved over into comic books but continued to do (as far as I can tell from the GCD) exclusively short features about little boys. Of the samples I've seen, you could substitute the Jigger or Little Dave logo on any of them and no one would be able to tell the difference. Now that's what I call over-specialization! Jigger, for the few clients that used it, began with the section on July 13 1936, and most likely continued to the end of the section, though the latest I've been able to verify from online sources is from December. Don't show this strip to Kristi Capel from FoxNews. She'd go gag-ga over the title. Sorry Allan...I just had to.